Streaming music startup Rdio is overhauling its look across platforms, and adding more robust personalization features powered by its own growing in-house music intelligence data-science team. The new Rdio also puts its free radio experience front and center, and the company wants users to know it’s one of the only places out there to go for free, streaming cross-platform radio with over 30 million tracks that works in a variety of international markets, in comparison to the limited global footprint of services like iTunes Radio and the smaller catalog of services like Pandora. That’s not how the rest of the industry has generally offered streaming music – instead, as Becherer pointed out, it’s been more of an ‘either/or’ arrangement, with some like Pandora and iTunes Radio offering up DMCA-compliant streaming radio services that more closely resemble traditional FM radio stations, and others like Spotify and the original Rdio focused more on on-demand streaming of specific artists, albums and tracks. What the goal of the redesign was to provide a more seamless way to experience either or both, depending on a user’s preference, from the same single provider. 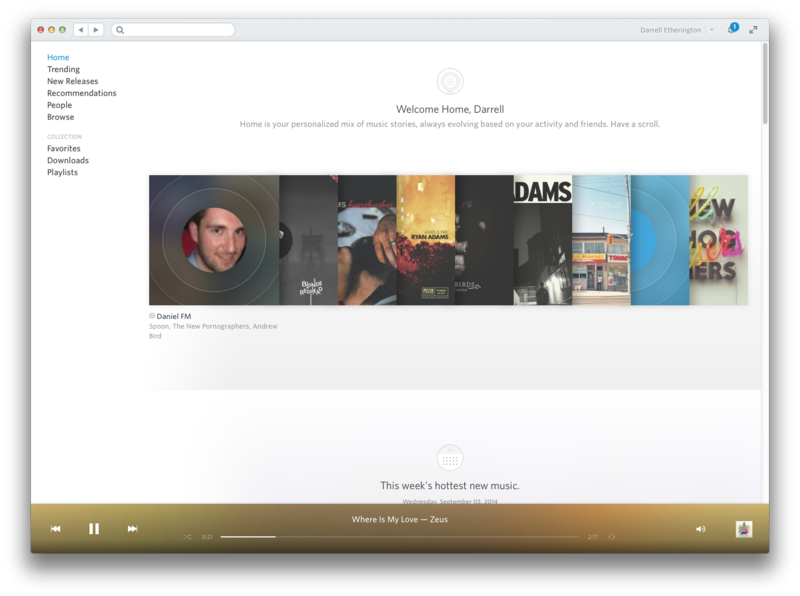 As for foregrounding the stations experience, Rdio is looking to make it apparent right from the start that free users have something to gain from the service, too. All action is centered on the new Home section, which replaces the ‘Heavy Listening’ category as the default landing page, and provides a different, but not hamstringed experience to uses who aren’t on an Rdio subscription, compared to those who are paying customers. Members who sign up but opt to use the free service have access to Rdio’s stations, which include human-curated content, genre and artist-based options and much more, but they won’t see suggestions of full albums or specific tracks to listen to on the Home page. Instead, they’ll see “stories” (Rdio’s term for its content sections in Home) that focus on things they can stream for free. Rdio still wants to convert these users to paid customers, but they’ve hidden the upsell prompts in more subtle places, with the idea being that they should only arise when a user is looking to be able to do more, and not act as a barrier to enjoyment of what is available without cost. Besides the station focus, which puts stations across the navigation experience instead of concentrating them in their own section, the app also now emphasizes a new concept of Favoriting, which lets you tap a heart icon to indicate you feel a particular zest for one item or another. Rdio’s using this data to inform its next generation of personalization, which it’s investing in heavily. In addition to working with partners like The Echo Nest, it’s been building its own internal data team and is working on making its in-house algorithms a distinguishing factor of the service. The plan is still for Rdio to cut ties with Spotify-owned The Echo Nest by the end of year when its current agreement runs out, and to hopefully move a lot of that data intelligence in-house. 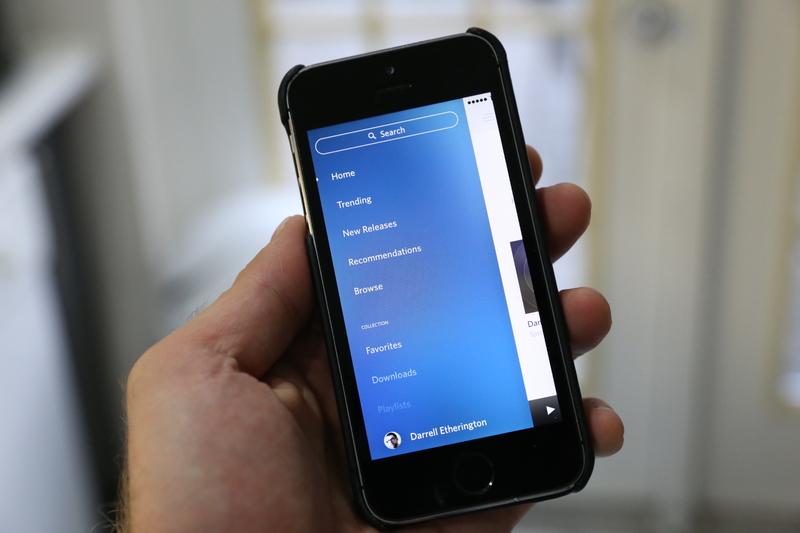 The redesign of Rdio is first and foremost to connect users with music, no matter what their desired level of investment of the service. After even my limited testing of the new features (via iPhone beta and the new web interface) I’d say they’ve succeeded. There will probably be an adjustment period for users used to the way things were, but for me, the changes are for the better.